OAKLAND | MAYOR | There were few fireworks during a two and a half hour Oakland mayoral candidates forum last Thursday hosted by the grassroots #Oakmtg Twitter hashtag group and even less new information on the candidate’s positions. However, one brief statement from Joe Tuman may have attracted the most positive response from the online community and represented the most poignant moment of the night. After Oakland Mayor Jean Quan trumpeted her mayor’s summer job programs had put a record 2,100 youths to work, she then suggested it was a factor in lowering crime in Oakland. At a forum, when just three of the mayoral candidates were randomly picked to answer each question, unfortunately for Quan, Tuman was in the trio chosen to respond and he was ready to pounce on Quan’s assertion. REGRETS? One audience question put Quan on the defensive when it asked how she would have handled the Occupy Oakland protests of 2011 differently. Not much differently, said Quan, except she would not have cleared the encampment at Frank Ogawa Plaza while away in Washington, D.C. The answer elicited a brief guffaw from the audience. Later, Quan added, the aftermath of the protests positively affected the police department. It changed how they train their officers to handle protests in Oakland and over 40 officers have been disciplined since, said Quan. “That made a difference. We have learned from that, but violence is not acceptable,” she added, whether from protesters or the police. VIEW FROM ABOVE Following the forum, I spoke to two Oakland residents who sat next me in the gallery. Both white (a older man and a younger woman), they said they were both totally undecided voters. And while they had been following the mayoral race, Thursday night was the first time they heard the candidates in person. Here are their first impressions: On Joe Tuman: both thought he had good ideas, but they felt like he was “not a nice person.” On Courtney Ruby: both came away from the forum very impressed by her background in trying to reform city government. However, the gentleman asked, “Is she electable?” On Jean Quan: they sensed she was disinterested throughout the forum. Lastly, neither likes ranked choice voting. KAPLAN STRONG While the #oakmtg forum moved along briskly, some candidates seemed on cruise control, while others lacked energy. However, Councilmember Rebecca Kaplan was energetic, exuberant and clearly prepared to pour as much information into each response as possible. Not only did she sound positive about Oakland, but she was also in a giving mood, detailing a future administration that offers free citywide wifi, longer library hours and a major retail and sports complex at the Coliseum. In fact, giving low information voters in Oakland the impression they might have free wifi is something they will remember. That is, if they ever get themselves to the polls in November. WHATEVER HAPPENS? In her closing statement, Mayor Quan made a comment that seemed wistfully ominous. “It’s an incredible honor to be the first woman and the first Asian American mayor in Oakland,” said Quan. “Whatever happens, it’s been an amazing honor to serve this community.” You can read into the statement however you choose, but it hardly exudes confidence for her re-election this fall. 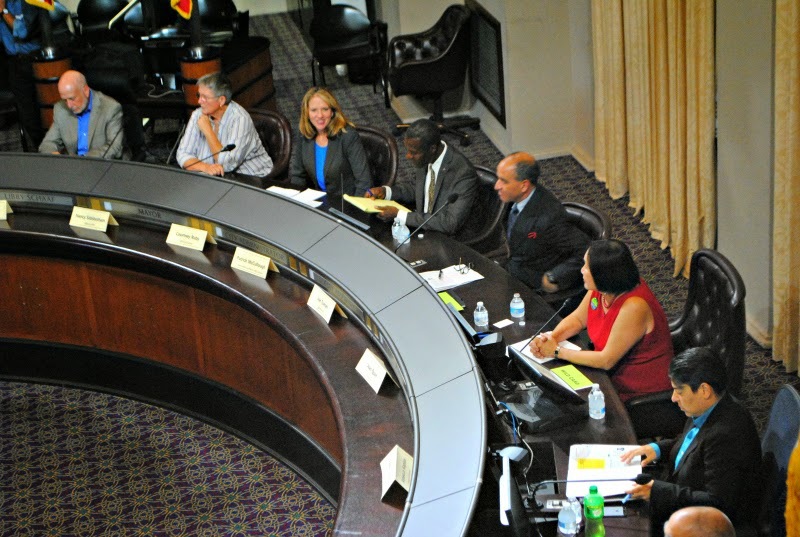 Posted in candidate forum, Courtney Ruby, Jean Quan, Joe Tuman, mayors summer jobs program, Oakland, oakland mayor, oakmtg, occupyoakland, Said Karamooz, Twitter. Bookmark the permalink. With her “extremely impressive record” of “many” and “great accomplishments,” I have the perfect nickname and campaign slogan for Jean Quan. Get to know Tuman….smart and tougher then I thought. Exactly who are these “undecided voters?” I've met Tuman myself and he's one of the most patient and considerate individuals I've met. Kaplan leads all the polls and will probably be the next mayor of Oakland. City of Oakland always spews false results and statistics to make their failures look like successes. They once did a presentation to a group and told them that their reentry program was successful because, although the participants did get rearrested and sent back to jail, they were for lesser crimes. The tacky spin caused people to laugh, but they persisted trying to sell this myth. Most revealing were the comments from the self-identified Oakland voters. Whose dimwitted take on candidates tells all about how Oakland keeps the same old, worn-out, accomplish-nothing people in office decade after decade. Second most revealing is the take of the writer on the nature of politics generally and Oakland politics specifically. Tavares, who seems completely lost in the wilderness, needs to be able to distinguish between a pol who talks the talk and a candidate who actually can walk the walk. Only candidate Tuman suggests the sorry fact that Oakland is not significantly different from Ferguson MO in its racial inequality. Brookings Institute IDs Oakland as one of the top ten unequal U.S. cities. The elephants in Oakland's living room are, as ever, our problems of institutionalized racism. Any other candidates who can open their eyes? Care to site sources or spew propaganda on behalf of your preferred candidate Kaplan? Dan Siegel's responses seemed to be getting the most approval from the audience. He knows that Oakland is a progressive city, and we need to set an example for the rest of the state and country on how a progressive city can be safe, prosperous, and just. Dan Siegel is a great and inspiring talker. He's what's known as a fine mouthpiece, a good lawyer, for this very reason. On the other hand if you look closely at Siegel's proposals they are at least questionably practical. Keep in mind that Siegel was an Oakland School Board member, a notably failure-prone institution, and also a long-time advisor to Mayor Jean Quan–a very failure-prone politician. The practical needs to be distinguished from the fantastical, no matter how charming the fantasy may be. One of the best ways to lower Oakland's crime rate would be to have a jobs program that would arrange a job for Jean Quan in which she would not be the mayor of Oakland.